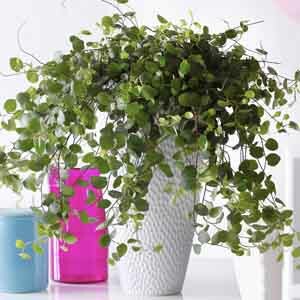 Also commonly known as “Wire Vine” because the plant forms a dense mass of wiry stems adorned with tiny round, glossy leaves. This New Zealand native can be grown outdoors in a planter for the summer or year-round in the garden in frost-free climates. It’s one of the best plants for training to a small trellis or topiary. Keep soil evenly moist. Apply a balanced liquid fertilizer monthly during active growth. Prune branches to maintain desired size.